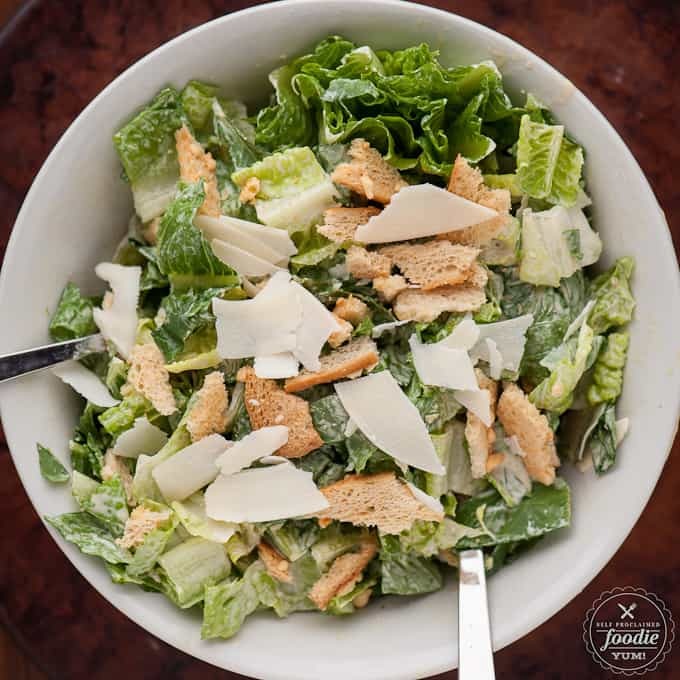 My family loves Ceasar Salad, and making my own Homemade Ceasar Dressing from scratch with anchovy paste, egg yolk, lemon and olive oil was incredibly easy! 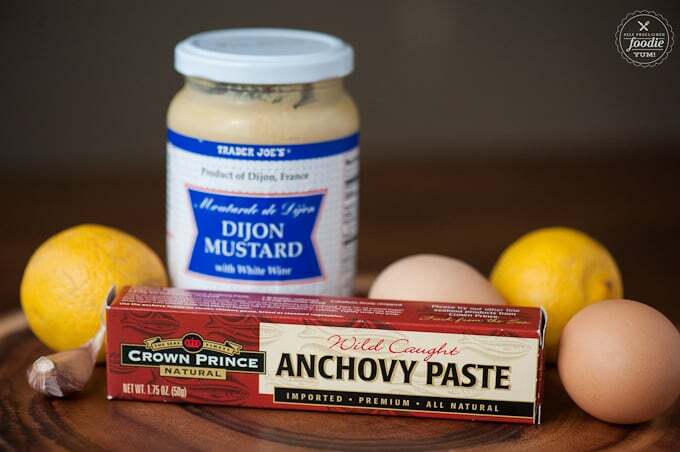 I can’t begin to tell you how many times I’ve bought anchovy paste with the intent of making homemade ceasar salad dressing, only to not do it. I’m not sure if I was intimidated by the fact that I was about to squeeze fish out of a tube and then eat it or what, but this process of planning and not executed actually spanned the course of several years. I finally made my dressing and was quite pleased with the results. I was going to name my dressing “classic” ceasar salad dressing, but the real version should include whole anchovies, which I didn’t have. I almost added salt to the dressing before I tasted it. That would have been a huge mistake because that anchovy paste is incredibly salty on its own. The lemon juice is necessary to balance it out. 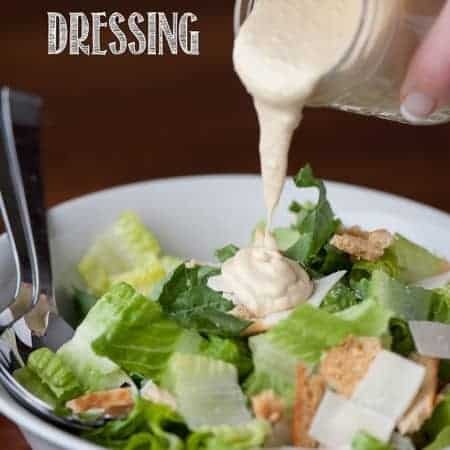 So don’t be intimidated to make your own homemade ceasar dressing. Its basically your average salad dressing which consists of an acid (lemon), fat (olive oil), and emulsifier (dijon mustard). That is the exact formula I used for my lemon herb vinaigrette. Oh. That’s not the part that intimidates you? Is it the raw egg yolk? That is exactly how I make my classic eggs benedict and I have never gotten the slightest bit sick. I use very high quality eggs, of course. Oh. Its the anchovies. Can’t help you there. 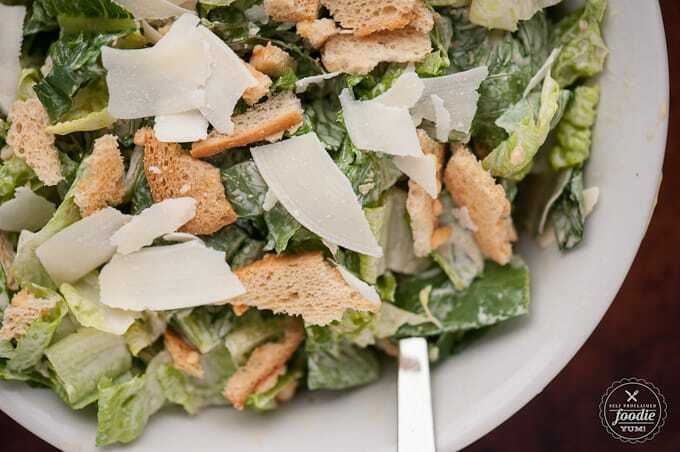 You can’t have ceasar salad without the fish. 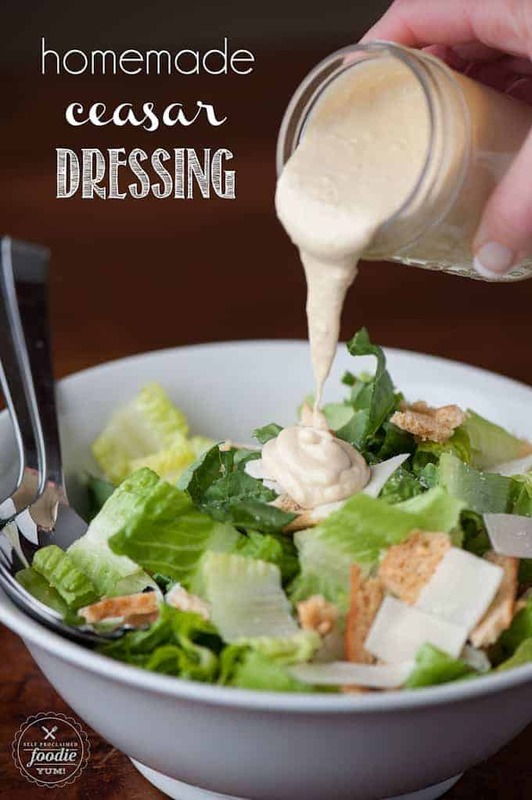 Anyhoo, the dressing was super easy to make and I enjoyed using fresh romaine, shaved cheese, and crushed up parmesan crisps for my croutons much more than opening up a kit and mixing it all together. We served this up for dinner with some homemade pizza and the whole family loved it! Combine all ingredients except for the oil in blender and blend on low for about 10 seconds. Combine the two oils in a measuring cup and with the blender running on low speed, slowly pour in a very thin steady stream of oil until it is all combined. Store in refrigerator until ready to use. Thin with additional lemon juice, if desired. Makes enough for two family sized salads. I made this today and added parmesan to it. We thought it was fantastic! This is new FAVORITE!!!! Thanks Krissy! Isn’t it bad to eat raw egg? Any replacements? I bought a lof of cans of sardines on sale. how would I use them as opposed to the paste? I would just mince them up real small.